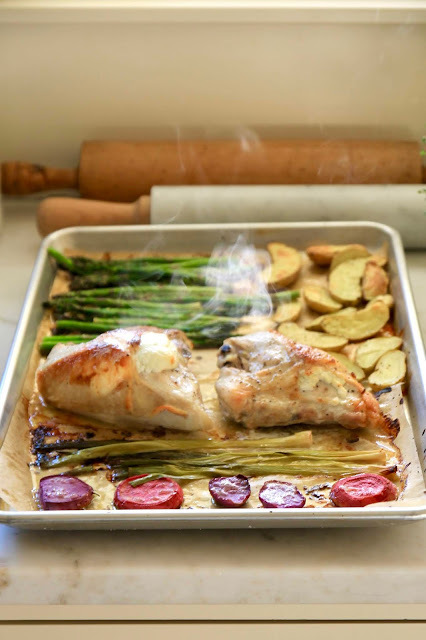 I love this system for weeknight dinners. This dinner took me 5 minutes to prepare - I sliced the potatoes and radishes in half, then I put some goat cheese under the skin of the chicken. 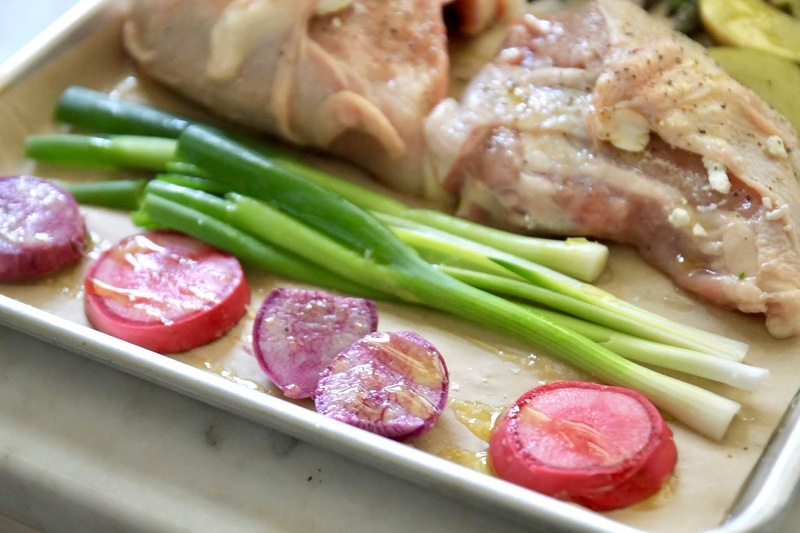 I drizzled everything with olive oil, a squeeze of lemon and a sprinkle of salt. It went in the oven at 400 for 30 minutes (except for the asparagus, I actually took it out after the first 10 minutes so it didn't get burnt to a crisp). 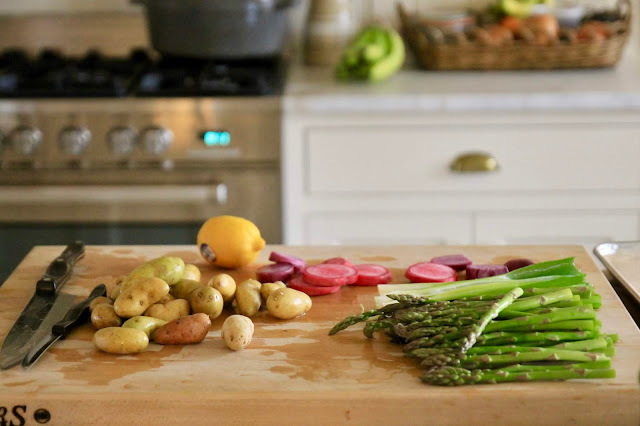 While it cooked, I cleaned up the cutting board, unloaded the dishwasher, put the groceries away and set the table. All of this started at 5:30 immediately after we'd gone to the grocery store. By 6:00 dinner was ready, the kitchen had already been cleaned up (during the 30 min cook time) and Mike walked in the door for dinner. This isn't the dinner anyone would request for their birthday, and it is definitely on the list of "lighter" dinners I make, but it is very yummy. Mike LOVED this dinner. He is always in the market for fresher, healthier, and simpler dinners without so many sauces and seasonings. The goat cheese cooked under the skin of the chicken is just enough of an indulgence to make it satisfying. I actually prepared two identical pans (4 chicken breasts) and baked them at the same time so we had enough for lunch leftovers the next day. Preheat oven to 400 degrees. Line Large Baking Sheets with Parchment Paper ($10), Place chicken breasts on the pan, place a generous slice of goat cheese underneath the skin of each. Slice potatoes in half. Trim asparagus ends. 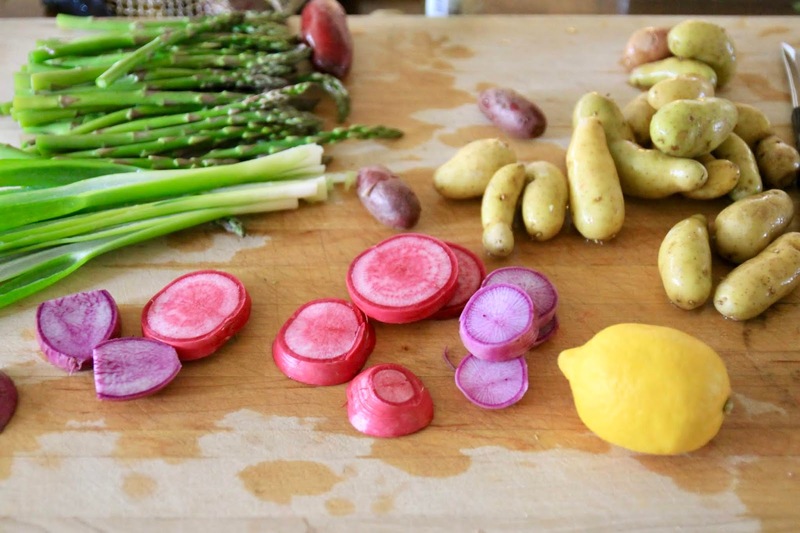 Slice green onions in half, slice radishes in half. 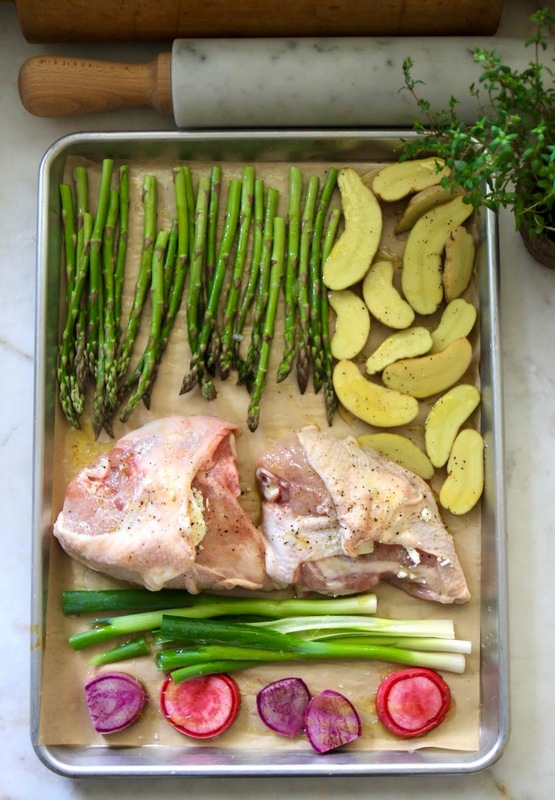 Arrange on baking sheet. Drizzle with olive oil, squeeze lemon and sprinkle salt all over the entire pan. Bake for 10 minutes, remove asparagus. Bake for another 20 minutes until chicken is 145 degrees. 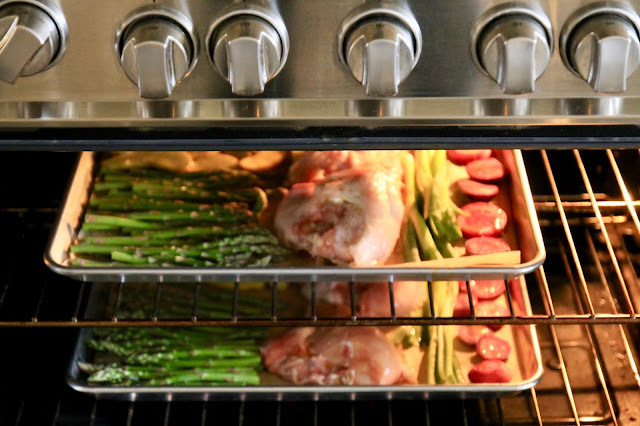 Remove from oven, put asparagus back on the pan and top with 1 tablespoon of butter. 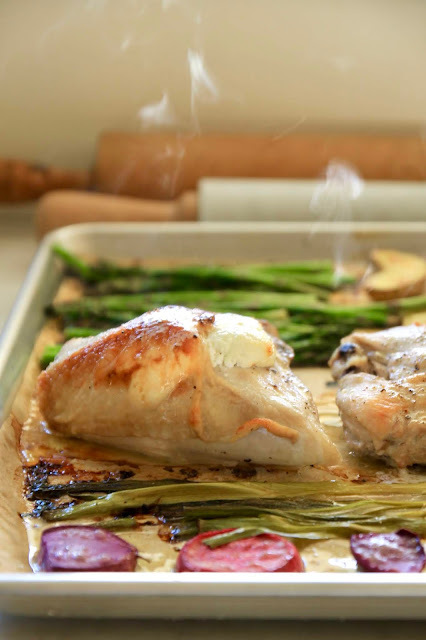 Place another tablespoon of butter on each chicken breast. Let rest for 5 minutes, then serve. 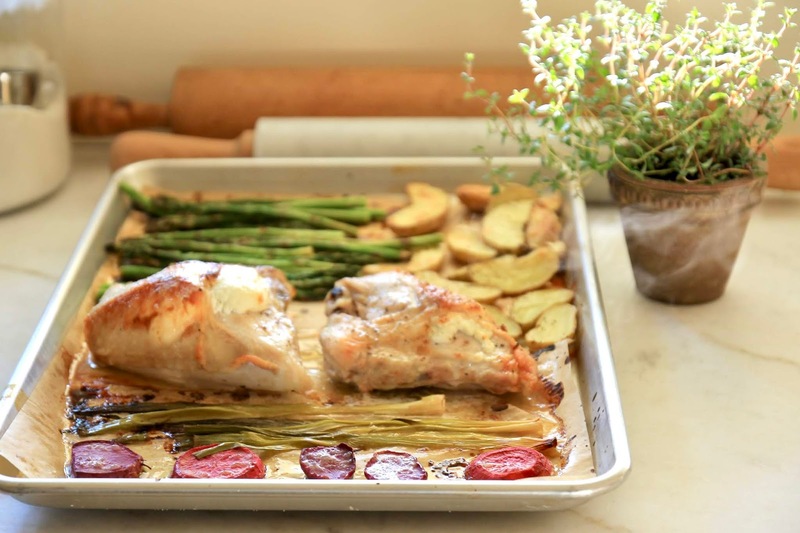 Pour juices out of pan and pour onto chicken and potatoes on plates. I love a colorful dinner! Emma loved these radishes - when roasted they tasted like carrots and obviously the color palette is amazing. 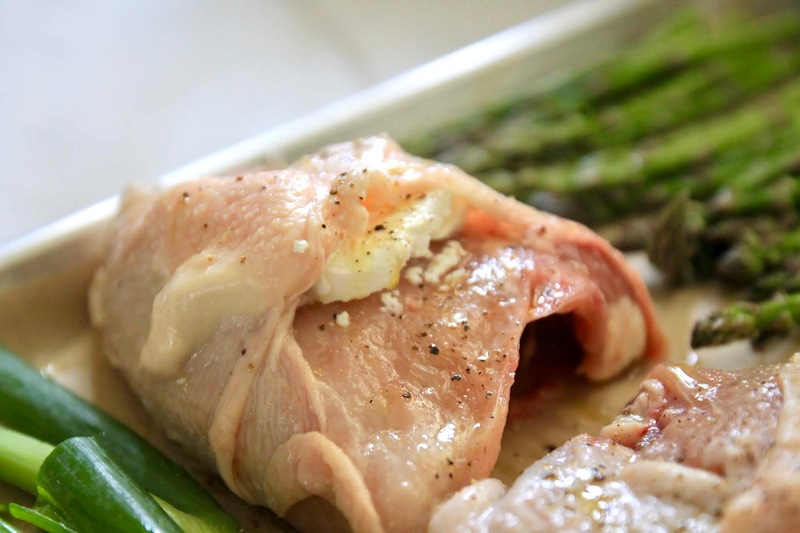 Sorry, closeup photos of raw chicken isn't always the best, but I wanted to show you how easy it is to slide a slice of goat cheese under the skin of a bone-in, skin-on chicken breast. 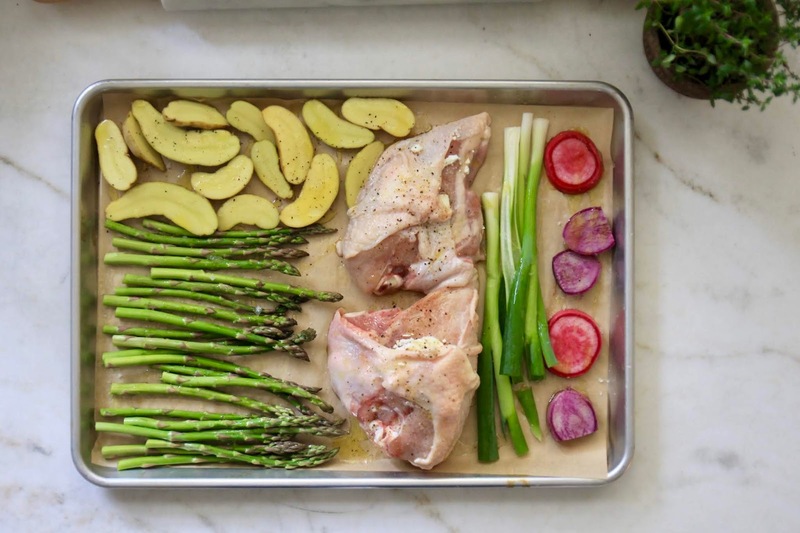 Are you interested in more sheet pan dinner ideas? I love that minimal dishes/pots/pans are required and that cleanup is so simple. It is also a fun challenge to see what I can come up with on just a sheet pan!